On first use, after activating GA4, only your Company name will be set in the header area. You will also want to add additional information, such as your company address and contact information. You can add your own letterhead within Garage Assistant very easily, please have a read through the following information for different types of letterheads which can be setup to make sure that you get the best out of your GA4 system. A letterhead makes a professional statement about your business. First impressions do count so make them work to your advantage, the more effort that goes into the image of your business the more you will get out of it. If you have a full letterhead then you will want to insert this image at the top right-hand side of the screen, you can either click within the "Full Header" grey bar or click on the + button. A window will appear allowing you to locate the image file on your computer. Alternatively, if you have a smaller image or multiple images you can insert these as above, all you need to do is decide the orientation of your images and insert via the corresponding section, as shown in the image above. You can also insert footer images in the same way. Garage Assistant supports most image formats such as Jpeg, Png or GIF however, there is a limit on the image size you can insert. This is to avoid excessively large images being used, since they are also included on PDF's when emailing documents. Please note that when editing the letterhead you cannot change the company name as this is linked to your activation for security reasons. When using a smaller image (not a full letterhead/footer image) text can be shown as well. Within these boxes, you can set up information for each type individually so when printing the corresponding text will appear. 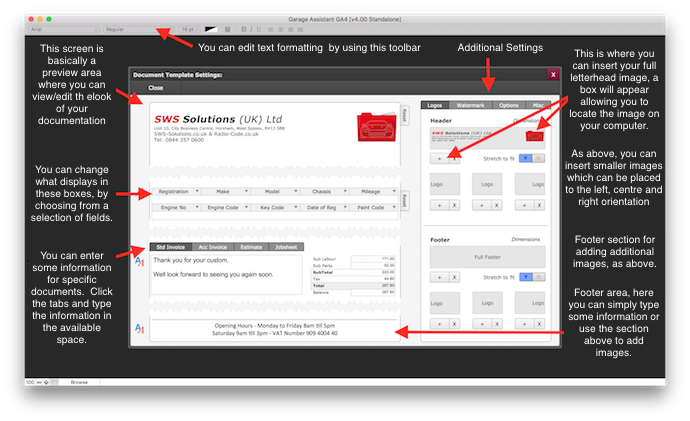 From the tabs towards the top right of the Doc Template Settings page, you will find a host of additional options and customisation features. A watermark can be added, which prints behind a document's main content. For this, it is best if your image is already faded in a way that it's suitable as a watermark, however even if its not you can make use of the Fade Image % option. It's worth noting that using this option will disable the watermark on PDF's due to how it functions. Blank header/footer for printed docs: This removes the header section, for use with custom stationery. Offsetting the customer address, useful when using windowed envelopes. Include advisories on the same page or a new page. Show or hide a "paid in full stamp" where relevant. Push totals to the bottom of the page, instead of them floating beneath the last line item. The misc tab allows you to individually change section headers for printed documents, such as Labour, Parts and Advisories. By default, they all use the same grey colour. You can select a custom colour for the four main document types, depending on the colour chosen, the text colour within that section should adjust automatically to remain visible. Here you can also toggle the display of certain information for the main document types. This allows you, for instance, to remove the customer's phone number from invoices, whilst retaining it on Job sheets.